The scope of the activities of the Section Wind Energy is to facilitate the development of wind energy technology and the expansion of the use of wind power all over the world through research and education. In its research activities there is a focus on large electricity generating wind turbines on the multi megawatt scale. Both technology development aspects as well as fundamental aspects of wind energy conversion are part of the research program. A small but challenging part of the research activities addresses the urban deployment of wind power. Regarding education several dedicated courses on the BSc and the MSc level are developed for students of the faculty and of the TU Delft. Apart from offering an MSc focus on Wind Energy for TU Delft Aerospace students, the section participates in the new 3TU MSc curriculum Sustainable Energy Technology and in the European Master course in Renewable Energy offered by EUREC. The Wind Energy group is involved in educational activities within the Faculty of Aerospace Engineering at both the Bachelor and Masters level. Experiments can be performed in speeds that range from the subsonic at 35m/sec to the hypersonic at Mach 11. On the 2nd of March Prof. Simon J. Watson gave his Inaugural lecture 'The Wind of Change'. Please find his lecture here on collegerama. The two major research areas are rotor aerodynamics and wind turbine design and research towards the use of wind power in the built environment. 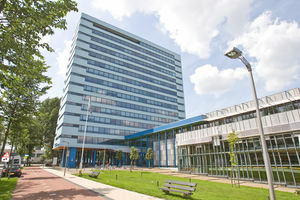 DUWIND is the wind energy network of the Delft University of Technology, undertaking research across 5 faculties in 13 groups. We closely collaborate with world top-ranked academic institutions, industrial global players, and national companies.